We have moved the business to a new space with a shop front at 57 St John's Street, Farncombe. We have moved to a fantastic new space at 57 St John's Street, Farncombe. 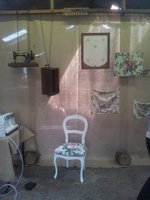 There is the addition of a great 8 metre shop window where we are selling furniture and fabrics. We were extremely pleased when asked to produce a unique grey and beige Corset Chair for the recent refurbishment of the stunning Burford Hotel in Surrey. 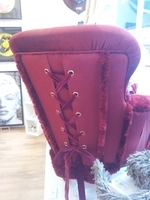 The Corset Chair is now available at 80 Golborne Road, W10. The shop is curated by Simon who owns The Chairman upholstery business. He has done work for Madonna, Elton John, Gwynith Paltrow, The Candy Brothers and many others. The Sarah Louise Dix Couture Label has recently collaborated with well established artist Caroline Lingwood and produced two, in a series of four, chair designs. The series is a tail of gradual deconstruction, with the first two pieces showing gradual progression from the traditional to the interesting unfinished both incorporating a pair of delicate white leather Victorian lady's gloves. The pair of Victorian open spoonback dining chairs have been reupholstered in Ian Mankin neutral linen. The first is plain with attached gloves and the second deconstructs from one side to the other, with raw edges, additional industrial studs, unfinished piping and frayed fabric. It has also been stitched to to give an impression of pencil strokes reflecting the glove shape into the chair covering. The Devonshire Fell hotel is part of the Duke & Duchess of Devonshire's estate in the stunning Yorkshire Dales. The hotel have recently refurbished a number of the individually designed rooms and commissioned a red Corset Chair with grey trim. I was lucky enough to be asked to go on the Channel 4 show4 Rooms on Friday 6th December. I had a fabulous time and sold my Corset Chaise Longue to dealer Jeff Salmon. 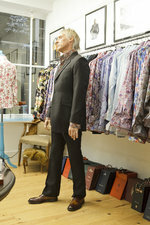 Jeff who was at Sotherbys for nearly a decade, owns Decoratum in Marylebone in London and other businesses. He specialises in mid 20th century design pieces. We are about to commence UK production of the Corset Chair with Nova Interiors. The chairs will be available in a range of fabrics to be confirmed. We are very pleased to announce that Nikki Alderslade has joined the company as administrator and production co-ordinator. Nikki has a wealth of business and management experience and bags of enthusiasm. Spot the two pieces from our Couture Collection!